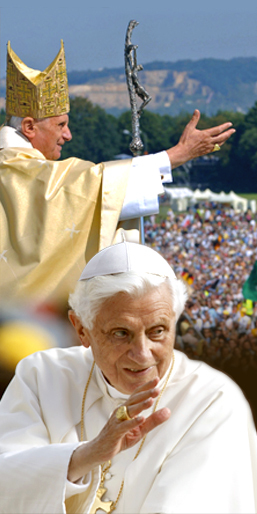 Earlier this month, the world learned of Pope Benedict’s decision to retire from the Papacy, effective today. As he steps down from his role as the leader of our Church, and in the days of transition that follow, our thoughts and prayers are with Pope Benedict XVI, who has worked so hard in leading the Church, and has always been such a good friend to the Knights of Columbus. We wish him all the best in his retirement. In addition, we pray for all those cardinals who will take part in the conclave, and for the pope’s successor, that God may inspire them as they carry out the mission with which they are entrusted. Our Supreme Chaplain, Archbishop William Lori of Baltimore has written a Prayer for the Church in this time of transition. I ask you to please commit to pray this prayer daily until the Church has a new pope, and to encourage your brother Knights and fellow parishioners to do the same. We have developed a website for this campaign: PrayerfortheChurch.com. In addition to sharing the prayer itself, please share this site with your council and your parish. The site will allow individuals to add their names to the list of those praying for the Church daily, and will assist them in sharing the prayer and their commitment with family and friends. I ask that you also encourage those brother Knights and their families that are on Twitter to show their prayerful support by using the hashtag #prayerforthechurch. If you're on Facebook, you can also pledge to pray and encourage your friends to do the same with our Prayer for the Church facebook app. Visit facebook.com/knightsofcolumbus for more information. The names of all those who pledge to pray this prayer will be brought to the Installation Mass for the new pope. Knights have long been supporters of the Church and the pope, and during this time of transition our prayers are especially needed. This prayer and corresponding campaign provide Knights and all Catholics an opportunity to show their solidarity with the Church through prayer. Thank you for your assistance and for your prayers for Pope Benedict XVI, for the Church, and for our future pope in this time of reflection and preparation. as Successor of Peter, and Your Vicar on earth. and sustain Your Church in faith, hope, and charity. who are the same yesterday, today, and forever.